susanskuseart – We shall not cease from exploration, and the end of all our exploring will be to arrive where we started and know the place for the first time. Steve Hillier, Otto Schmidinger and I will be showing our work again at our group show, Triple Vision 2019, at the Robina Community Centre gallery from Tuesday 29th January until 11th February. Here are some brand new pieces that will be shown there for the first time. Susan Skuse | Learning to Fly | Oil and Aerosol on stretched canvas | 102 x 102 cms | $1950 | Available from Montville Gallery, Montville. 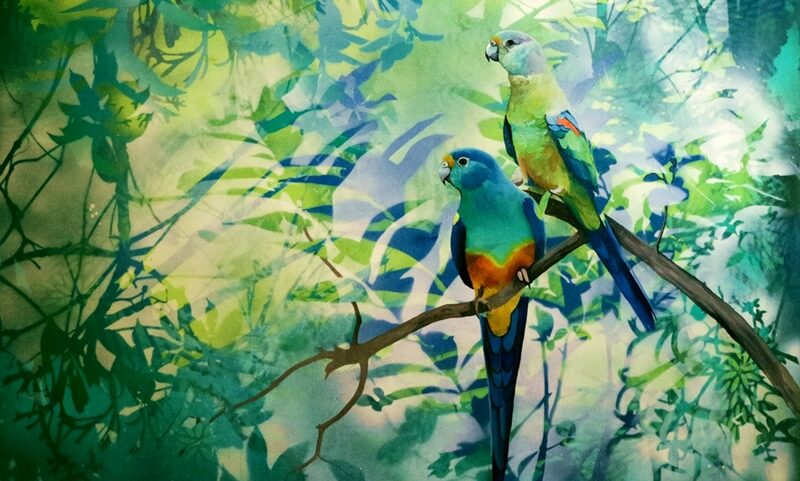 Susan Skuse | Budgie Business | Aerosol and Oil on stretched canvas | 60 x 150 cms | $1250 | Available from Montville Gallery, Montville, Queensland. Susan Skuse | Forest Conversation | Oil and aerosol on stretched canvas | 61 x 91 cms | $1200 | Available from Montville Gallery, Montville, Queensland. Susan Skuse | All Dressed up and Nowhere to go (Crimson rosella and Rose crowned fruit dove) | oil and aerosol on stretched canvas | 91 x 61 cms | $1250 | Available from Montville Gallery, Montville Queensland. Susan Skuse | Boobook Babies | Oil and aerosol on stretched canvas | 46 x 46 cms | $500 | Available from Montville Gallery, Montville, Queensland. Susan Skuse | Crows, Rose and Michelangelo’s | 91 x 61 cms | Oil and aerosol on canvas | $1250 | Available from Montville Gallery, Montville, Queensland. 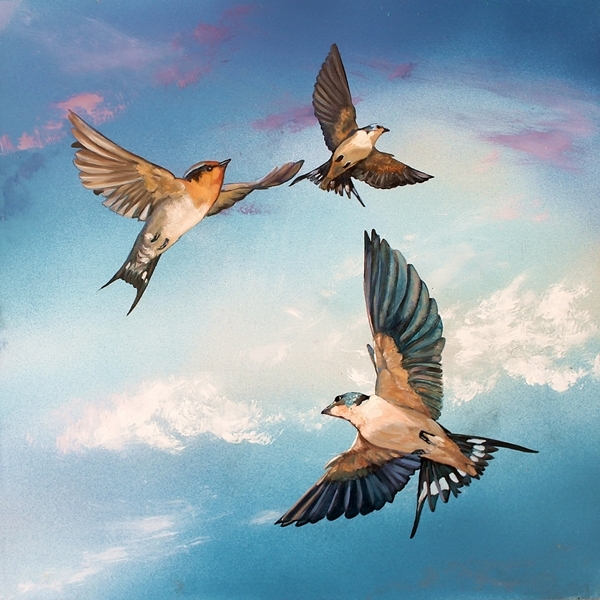 Susan Skuse | Figbirds | 60 x 60 cms | Oil and aerosol on stretched canvas, framed | $650 | Available from Montville Gallery, Montville Queensland. Susan Skuse | Frog catching seminar (Cattle egrets) | Oil and aerosol on stretched canvas | 71 x 101 cms | $1300 | Available from Montville Gallery, Montville Queensland. Susan Skuse | Here’s Looking at You, Kid (Yellow tufted honeyeater, striated pardalotte, blue-faced honeyeater), Oil and aerosol on stretched canvas | 71 x 101 cms | $1300 | Available from Montville Gallery, Montville, Queensland. Susan Skuse | Redbacks (Red backed wrens) | Oil and aerosol on stretched canvas, framed | 84 x 84 cms | $1300 | Available from Montville Gallery, Montville, Queensland. Susan Skuse | Three’s a Crowd (Pale Headed Rosellas), 71 x 122 cms | Oil and aerosol on stretched canvas | $1400 | Available from Montville Gallery, Montville Queensland. Susan Skuse | Garden Party #3 – New Holland Honeyeaters } | 60 x 91 cms | Oil and aerosol on stretched canvas | $895 | Available from Montville Gallery, Montville, Queensland. Susan Skuse | Garden Party #4 – New Holland Honeyeater and Cockatiels | Oil and aerosol on stretched canvas | 60 x 91 cms | $895 | Available from Montville Gallery, Montville, Queensland. Susan Skuse | Rainforest Dream | aerosol and oil paint on stretched canvas | 100 x 100 cms | SOLD through Art Lovers Australia online gallery. No-one could have been more surprised (or delighted) than me when my painting, Rainforest Dream was announced as the winner of the Art Lovers Australia art prize last month. The painting will soon be on its way to a new home, as well, which is also very pleasing. It feels as though I’ve been very busy since the beginning of this year, and taking some time to update this page with my 2018 works to date, I can see why. Susan Skuse | The joy of flight – Major Mitchell cockatoos | Photo credit Ruth Sandow | lithographic ink, aerosol and oil on canvas | 60 x 90 cms | available from Montville art Gallery, Montville, Queensland. Susan Skuse | Life – it’s so confusing (Southern Boobook owls) (detail) | Photo credit Chris Spencer | available from Montville art gallery, Montville, Queensland. Susan Skuse | Rainforest Dream | aerosol and oil paint on stretched canvas | 100 x 100 cms | SOLD by Art Lovers Australia online gallery. Susan Skuse | Secluded Glade – Ring necked parrot | acrylic, aerosol paint and oil on canvas | 60 x 40 cms | available through Art Lovers Australia online gallery. Last week was a very busy one, with one half of the team (Sue) up in Brisbane for the Brisbane Art Prize and Life Art Worldwide Expo, while the other half (Steve) manned the gallery. What can one say? Well, no experience is ever entirely wasted, and it was a great opportunity to meet and chat at length with wonderful regional artists such as Lyne Marshall, Kym Barrett and Beatrice Prost. Perhaps we could consider an invitational Art Expo at Hillier Skuse Gallery some time next year? What do you think? 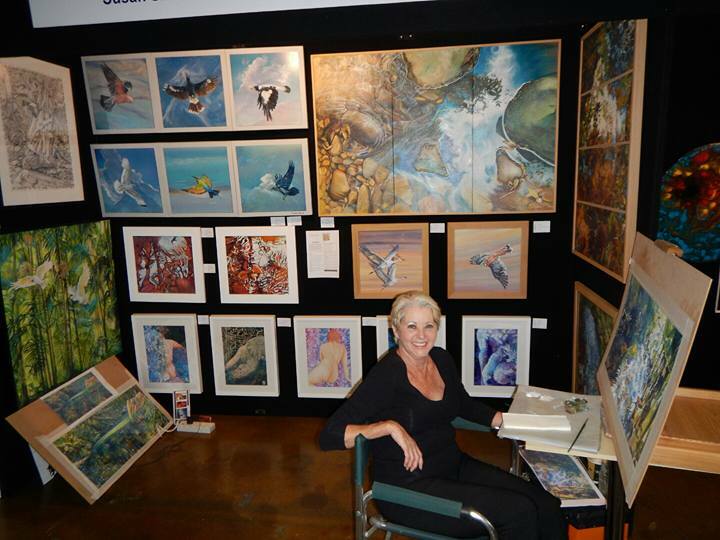 Susan Skuse filling the unforgiving moment with sixty second’s worth of painting, at the Brisbane Art Prize Expo. Our first twin exhibition openings are coming up in a little over a week. We are excited about the wonderful works our two artists have been producing, and we think you will be too. It should be a great show and a fun night. Every day lately, wonderful new works have been coming into the gallery. Striking and innovative work from David Warren, beautiful romantic works from Tony Duarte and atmospheric seascapes from Leisa O’Brien, just this week. Our two featured artists have very different ways of reacting to the landscape around them, but love of the natural world is paramount for both of them. We hope that you will find something that resonates in this show, whether your taste runs to the contemporary, or to the traditional. For anyone seriously on a mission to acquire that special piece of artwork, pre-show viewing can be arranged by contacting us at contact@hillierskusegallery.com.